Inside "Deleting ELECT in the bible"
The book consist of two main types of pages. Pages in the standard upright position just like the contents pages example below and, pages in alignment with the spine of the book - 90 degrees to normal - just like the next example below of a reference type page for a passage. The second type of format enables more information from different sources to be seen together. More on the example below. An introduction including a large element about the Septuagint (LXX) - what it is and why it still matters. A presentation of all the results the LXX reveals in regards to the 24 Hebrew (Heb.) words associated with the Greek (Gk.) word EKLEKTOS. 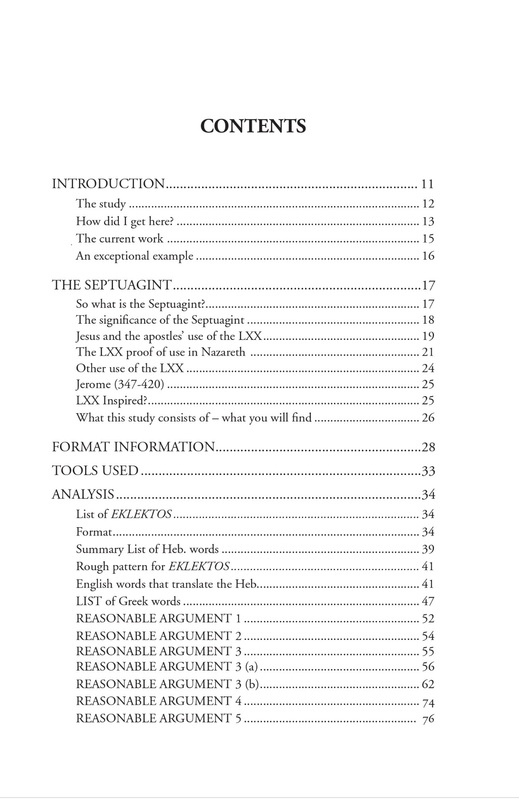 An analysis of all this information with step by step reasonable arguments to reveal the use of EKLEKTOS in the LXX. The second main section is for Reference and has all text at right angles: read in landscape view. 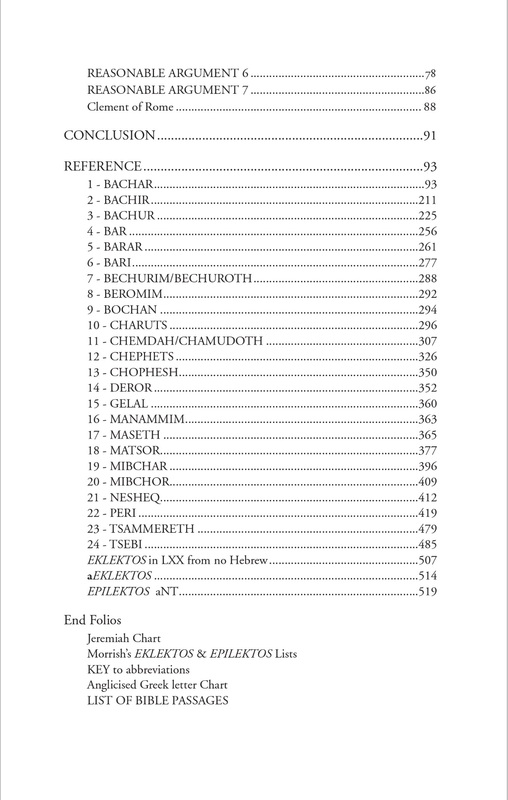 A chapter for each of the 24 Heb. words which EKLEKTOS translates. A summary from the Robert Young and the James Strong concordances introduce the chapter for each Heb. word. These Heb. words occur a total of 594 times. They are all given. The Gk. word rendering is revealed. A commentary is added. A further 28 passages round this off. A chapter for the word EPILEKTOS. This means a total of 622 passages are quoted from the LXX. An exhaustive presentation of every directly or indirectly related passage to the translation of the Greek word EKLEKTOS. End index and abbreviation pages. The bible reference is followed by the KJV text - the text identified by Strong and Young in their concordances. This text section is the Heb. translated into English (Eng.) and is the independent witness to the meaning of the Gk. word used in the LXX. Another bible quote, often the YLT as this literal version can often be seen to show the LXX text is closer in arrangement to the Heb. text than the KJV. For the analysis all passages which need particular attention also have quotes of the NKJV, NIV, NASB, NLT added to the KJV and YLT. 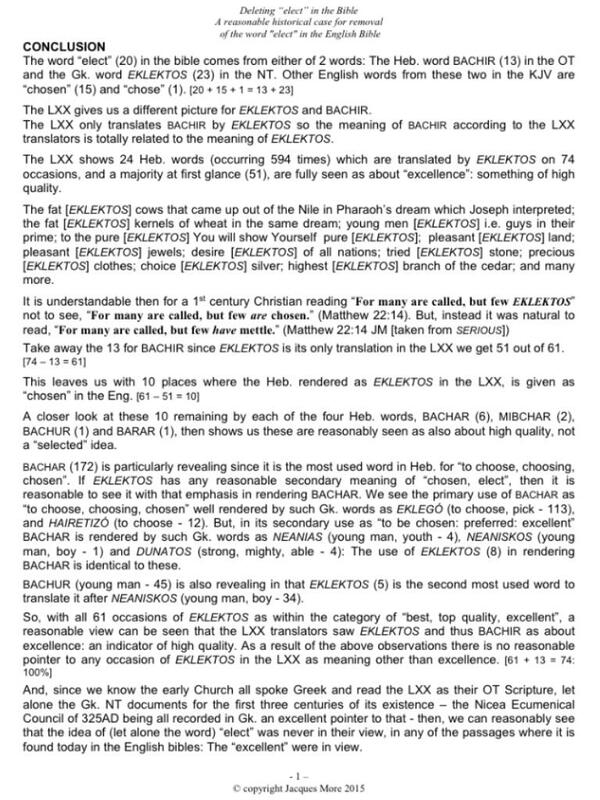 A comment follows which identifies the Greek word used in the LXX to translate the Heb. word. A statement as to the literal or loose translation by the LXX and an example of how this can be seen. A quick explanation of what the Gk. word is used for. This is followed by the LXX text itself with the Gk. letters in Anglicised form and without punctuations or accents, but the space between words maintained: this gives the reader a small taste of what reading the Uncial text was like [more information on format is in the designated pages]. An interlinear word or words for each Gk. word is supplied. This helps the reader recognise the LXX text is the one that translates the passage in view. 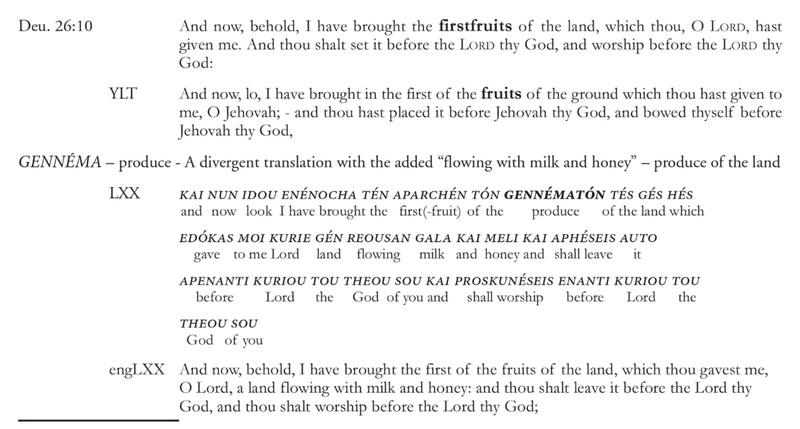 Finally, the full translation of the LXX into Eng. by Sir Lancelot. This is the body of the book with 85% space taken up by this work with a total of 622 passages looked at. For each of the passages that require particular attention here is an example of all the versions quoted. For the sake of the full example with all bible versions represented the following copyrights apply to the bible texts. All other text on this page is copyright free. Used by permission of Tyndale House Publishers,Inc.